There are a few things you should do before buying property. First, start saving for a down payment. A typical down payment for a traditional mortgage or construction loan is 20%. However, there are financial products that require as low as 3% down in exchange for higher monthly payments. Bottom line? Just start saving. The more you put down the less expensive your borrowing will be. Second - get pre-approved for a loan. This means some financial institution has checked your credit & assets, and already pre-approved you for a certain loan amount. Sellers are typically more motivated to deal with those who have been pre-approved. It shows capability to make the transaction. Next, you should begin looking for property if you haven’t already. Before purchasing land to build on you will need to collect the pertinent zoning and environmental information for each property. This will help you determine which sites are right for you and which ones will let you build what you want. This research and analysis is more commonly called a feasibility study and can be provided by most architects - usually at an extremely high expense. Fabric[K] Design has developed two products to make this service more robust, accessible, and cost effective for everyday hardworking people. Our Zoning and Possibility Packages are products that gather all the important regulatory information for you and help explore the possibilities of your potential project through schematic visuals. We also include other important data like a broad neighborhood analysis, all to guide you in choosing the right property for your project. Once you find the right property and you like the neighborhood it’s in, find a realtor and make an offer. Real estate climates can be very unpredictable. You may have to cycle through this process a few times if someone beats you to the punch or makes a better offer. The key is to find a focus area or neighborhood that really resonates with you so that you can concentrate your efforts and research. Now, the design process really begins. You have two main options here. The first and most common route for individuals building a new home or similar residential product is to buy a plan set. Plan sets are pre-designed drawings of buildings that you can purchase turn-key ready. Find an architect or plan set provider, purchase the design you like and take the documents to a contractor. Depending on the set a licensed builder will be able to estimate, pull permits and build the building from these documents. Regulations vary from place to place, so there maybe some extra engineering and certification which can be handled by any licensed contractor. 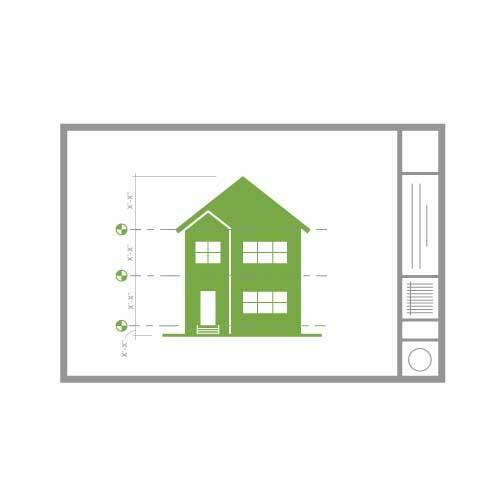 Plan sets are the most common way that people design their homes because it saves them time and money. The other route you can take is to have an architect design a custom building solution for you. This process takes more money and time. But the client also gets more value and service from the architect in return, not to mention a completely unique building. While the home is being designed or you’re choosing your plan set, you should be applying for a construction loan (unless you’ve got fat pockets). There are two main construction loan types. A Construction to Permanent Loan is two loans in one. Once approved you borrow from a line of credit to pay for construction. When the building is complete, you’ll receive a Certificate of Occupancy and the lender will then convert the construction debt into a standard permanent mortgage. Some benefits to this type of loan product are lower fees, options for 15 or 30 year paybacks, and interest is paid only during construction. A down side is that you will most likely have to put down 20%. The second is a Stand Alone Construction Loan which consists of two separate loans. One pays for construction and the other is a mortgage that pays off the cost of construction. This option is good for those with low cash flow, poor credit and the need for a lower down payment. A downside is that you pay two sets of closing costs & fees. Talk to you local lenders to determine the best option for you. The contractor you choose will be determined by the financing product you choose. Most federal and state funded products require you to choose from a list of pre-approved contractors. If you use a private product then you (and your architect) have the liberty to choose which ever builder you’d like. Most basic architectural services will provide assistance in choosing a builder. Construction schedule for the building depends on many factors - size, complexity, weather. etc. - but as a general rule construction time for a house (building with 1-4 units inside) or small commercial building will take anywhere from 9 months to a year. When the building is complete it will get inspected. If everything checks out, the inspector will give you a Certificate of Occupancy. At this point, the only thing you have to do now is move in and enjoy your newly built building. DO YOU NEED HELP FIGURING OUT IF A CERTAIN PROPERTY IS WORTH INVESTING IN? 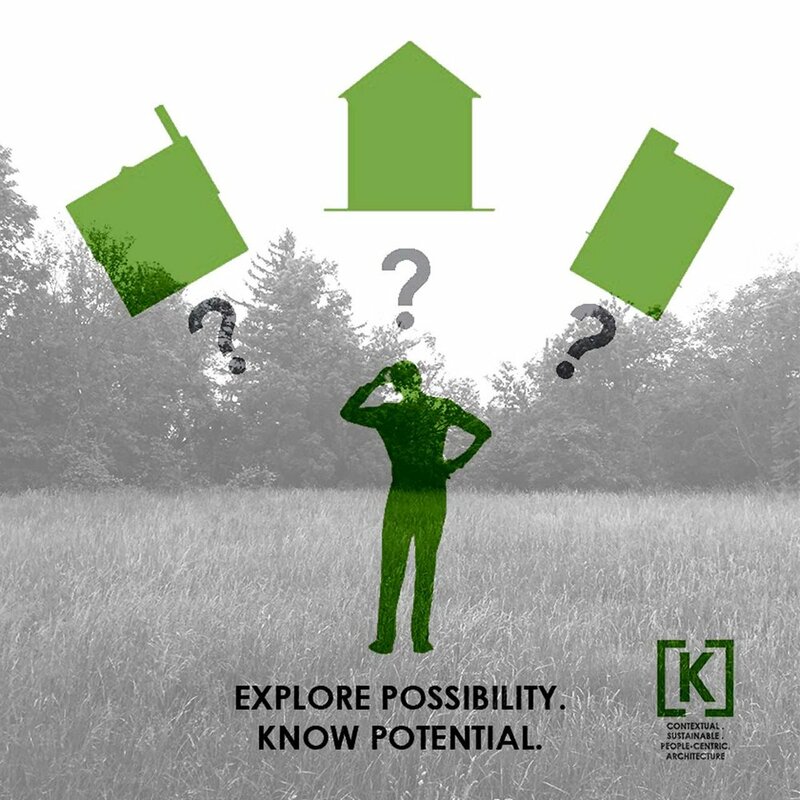 ARE YOUR CURIOUS ABOUT A POTENTIAL DESIGN PROJECT in your neighborhood? OUR ZONING AND POSSIBILITY PACKAGES CAN HELP. LEARN MORE!